Cyclists (and pedestrians) are exposed to traffic pollution while moving around in city centres and urban environments. Their level of exposure can differ significantly from street to street. Fixed monitoring networks offer high quality data, but are unable to offer detailed street level exposure information. Air quality models are able to offer detailed exposure information, but are often complex and require high-quality, up-to-date input data (e.g. detailed traffic situation, street composition, weather conditions, ...) which is not always available. 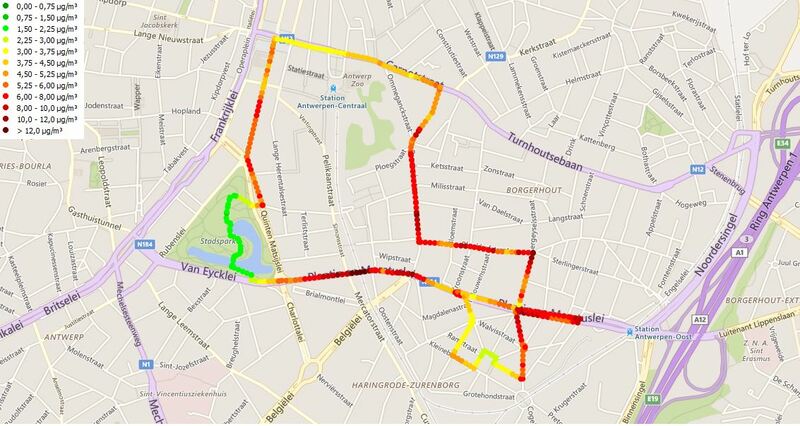 With airQmap detailed exposure maps are produced based on mobile air quality measurements by cyclists or pedestrians. Numerous influencing factors are taken into account while offering a high level of detail. AirQmap measures the exposure of cyclists or pedestrians to Black Carbon (BC). Black Carbon (BC) is the combustion related ‘soot’ component of particulate matter. The most important sources of BC are traffic and domestic heating. Exposure to black carbon is associated with cardiovascular and pulmonary diseases. BC is recognized by the World Health Organization (WHO) as a better indicator of harmful particulate substances from traffic than undifferentiated particulate matter (PM) mass. That's why BC is a highly suitable component for drawing traffic pollution exposure maps.